Graham crackers aren’t found on supermarket shelves here like they are in North America. I remember the crackers always seemed to turn in novels I read as a youngin’ – especially The Baby-sitters Club Series. The BSC girls always had the coolest stuff, like Graham crackers and scrunchies. 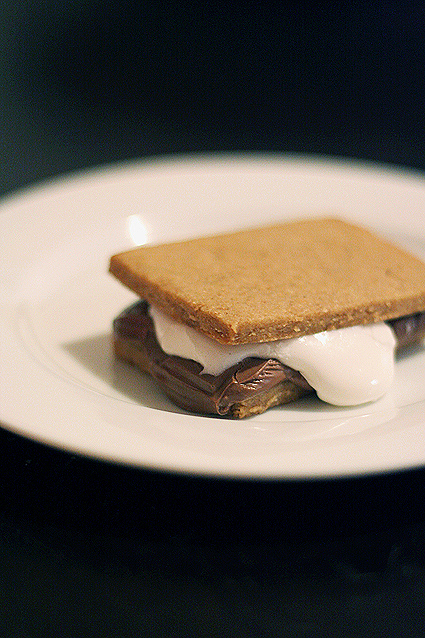 Most Australians have never had a s’more, and in fact this was my first. I think we should change that, one Graham cracker at a time. I had to improvise, I used a microwave as I didn’t have a camp fire handy. Preheat oven to 350 degrees. Whisk flours, wheat germ, salt, baking soda, and cinnamon in a medium bowl; set aside. Put butter, brown sugar, and honey into the bowl of an electric mixer fitted with the paddle attachment; mix on medium speed until pale and fluffy, 2 to 3 minutes, scraping down sides of bowl as needed. Reduce speed to low. Add the flour mixture, and mix until combined. Turn out dough onto a floured surface, and divide into quarters. Roll out each piece between 2 sheets of floured parchment paper into rectangles a bit larger than 9 by 6 inches, about 1/8 inch thick. Using a fluted pastry wheel, trip the outermost edges or each rectangle, and divide into three 6 by 3-inch rectangles. Pressing lightly, so as not to cut all the way through, score each piece in half lengthwise and crosswise, to form four 3 by 1 1/2-inch crackers. Stack parchment and dough on a baking sheet and chill in freezer until firm, about 20 minutes. Remove two sheets of dough from freezer. Pierce crackers using the tines of a fork. Transfer to large baking sheets lined with parchment paper. Bake, rotating halfway through, until dark golden brown, 8 to 9 minutes. Repeat with remaining dough. Let cool on sheet 5 minutes; transfer crackers to wire racks to cool completely. Cook’s Note: Crackers can be stored in an airtight container at room temperature up to 3 days.